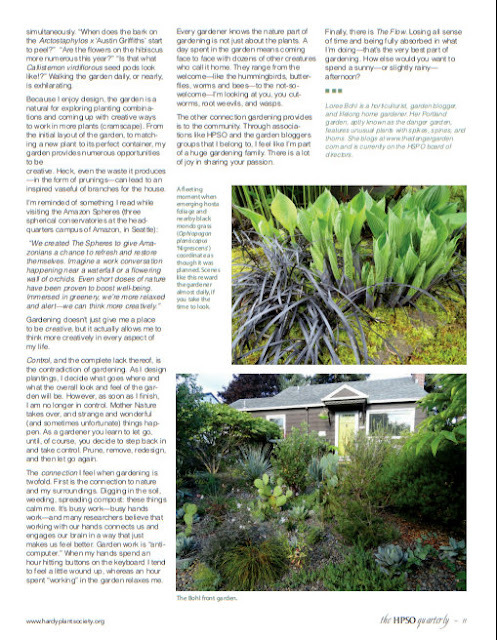 For the summer issue of the Hardy Plant Society of Oregon's (HPSO) Quarterly magazine I was asked to write an essay answering the question of "why I garden". Over the years a wide range of gardeners have answered the question, and I've always enjoy reading their replies. I thought I would share what I wrote here, and invite my readers and fellow bloggers to to join in. Why do you garden? Answer below, in the comments, or take on the question in one of your future blog posts. I would love to know! I used to bristle at the question of why I garden, when the answer seemed so obvious. Why do you eat, sleep, breathe? Because you have to; doing these things means you’re alive. You don’t think about why—you just do. However, over the years as I’ve been reading the HPSO Quarterly, many respected gardeners have answered that question with thoughtfulness and creativity. It’s time to get over my insolence and dig a little deeper. I come from a gardening family. Both my mother and father garden. Dad takes pride in his productive (and tasty) vegetable garden, and Mom has always had a stunning ornamental garden. Stepping back another generation, my maternal grandparents also gardened. My grandma’s plant palate was limited, but she grew a mean hosta and had the most beautiful purple clematis I’ve ever seen. My grandpa was a vegetable gardener extraordinaire. Sugar snap peas, cucumbers that became the most delicious dill pickles, and enough zucchini for my grandma to bake up dozens of zucchini bread loaves that we froze and ate all winter. Oh, and don’t get me started about the rhubarb, which of course became strawberry rhubarb pie. Funny thing is, as a kid I honestly had no idea you could buy any of those vegetables in the grocery store: I thought my grandpa was magic. working in the garden then this is the perfect place to spend a summer afternoon." Researching new plants, tracking them down, and watching them grow satisfiesa desire to learn and acquire knowledge—curiosity. Gardening is like having hundreds of experiments all running simultaneously. “When does the bark on the Arctostaphylos x ‘Austin Griffiths’ start to peel?” “Are the flowers on the hibiscus more numerous this year?” “Is that what Callistemon virdiflorous seed pods look like! ?” Walking the garden daily, or nearly, is exhilarating. Because I enjoy design, the garden is a natural for exploring planting combinations and coming up with creative ways to work in more plants (cramscape). From the initial layout of the garden, to matching a new plant to its perfect container, my garden provides numerous opportunities to be creative. Heck, even the waste it produces—in the form of prunings—can lead to an inspired vaseful of branches for the house. Gardening doesn’t just give me a place to be creative, but it actually allows me to think more creatively in every aspect of my life. the gardener almost daily, if you take the time to look. And bottom: "The Bohl front garden." Control, and the complete lack thereof, is the contradiction of gardening. 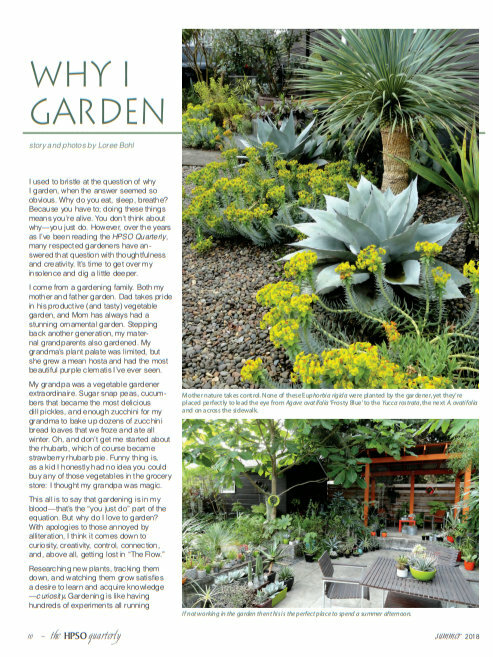 As I design plantings, I decide what goes where and what the overall look and feel of the garden will be. However, as soon as I finish, I am no longer in control. Mother Nature takes over, and strange and wonderful (and sometimes unfortunate) things happen. As a gardener you learn to let go, until, of course, you decide to step back in and take control. Prune, remove, redesign, and then let go again. The connection I feel when gardening is twofold. First is the connection to nature and my surroundings. Digging in the soil, weeding, spreading compost: these things calm me. It’s busy work—busy hands work—and many researchers believe that working with our hands connects us and engages our brain in a way that just makes us feel better. Garden work is “anticomputer.” When my hands spend an hour hitting buttons on the keyboard I tend to feel a little wound up, whereas an hour spent “working” in the garden relaxes me. Every gardener knows the nature part of gardening is not just about the plants. A day spent in the garden means coming face to face with dozens of other creatures who call it home. They range from the welcome—like the hummingbirds, butterflies, worms and bees—to the not-so welcome—I’m looking at you, you cutworms, root weevils, and wasps. The other connection gardening provides is to the community. Through associations like HPSO and the garden bloggers groups that I belong to, I feel like I’m part of a huge gardening family. There is a lot of joy in sharing your passion. Finally, there is The Flow. Losing all sense of time and being fully absorbed in what I’m doing—that’s the very best part of gardening. How else would you want to spend a sunny—or slightly rainy—afternoon? Of course I didn't mention the most important thing, it seemed so obvious why did I need to? Because I love plants!!! I know several members who don't live in the Portland area but enjoy the publications and visiting the open gardens when they come to down. Interested? More info here. Loved this: "Gardening is like having hundreds of experiments all running simultaneously." Truth! A pleasure to read this, Loree. Wish I could explain and trace my obsession through the family tree, but I'm definitely the outlier in this family! Thanks Denise, glad you enjoyed! Very well said. I've often thought of my garden as a big set of crazy experiments too. My parents had a vegetable garden for a while when I was very small, I barely have memories of it, and my mom had tulips. Truth be told, she and my MIL both disparaged my garden and home in Massachusetts, so I can't claim encouragement from that quarter. I think in some weird way for my particular personality DIS-couragement is an impetus. I don't know where I got my penchant for growing things. I've always felt like an oddball in my family. Oh boy, I know exactly what you mean by DIS-couragement as an impetus, me too. Although not on the garden front. I think you covered that nicely. Plus great photos to illustrate it. I would pretty much agree with your lists but I often say it is just another art medium, and thus fits with everything I’ve ever done. Gardening as art...I started another essay on that awhile back, with special emphasis on the critique end of things (why are gardeners so nice to each other?). Maybe someday I'll get around to finishing that. I share your reasons, Loree. Gardening is done with the brain, hands, eyes, and heart. It's completely engaging. Beautifully stated, Loree! I can't claim to have come from a gardening family but I do have a strong early childhood memory of puttering around in the garden with my father, who died in an accident when I was 6. To this day, I believe that memory drove me to start collecting indoor plants when I was a tween. My indoor plant collection grew larger and larger until I finally got my first chance to garden outside on a small scale at a rental property. The desire to have more space to garden drove my push to buy our first house, as well as the purchase of the second one with its much larger garden. Today, I garden as a creative outlet and because it connects me to something larger than myself which I hope, in a very small way, contributes to a better and more beautiful world. And gardening itself is a meditative activity, something we all need in the face of the sometimes ugly realities of daily life. That's so young to lose your father, I'm glad you have that memory. Well said. I share your reasons for gardening and it seems that I've always gardened. So many memories of garden mentors and gardens. Working with children is much the same although with gardening, you get to swear out loud when a hose you're dragging rips off the only new leaf of your favorite plant or topples a pot making a huge mess. And you're not arrested if you chop the head off a plant. Don't do that with the kids! Well said! Clearly coming from a gardening family doesn't ensure a future gardener. I have two sisters. One doesn't garden, the other gardens a bit (and likes to torture me with weird questions like can she over wintering a tomato plant inside), and I garden almost daily. In a lot of ways besides enjoying plants and being outside, I garden because I like building and creating things in the garden. I seem to like the hard work of it all. Were you tempted to say yes to the tomato question? Just for fun? I had a busy day yesterday, but took about 10 minutes and made a pass through the garden, it made everything okay!